Louisiana Gov. John Bel Edwards (D) is expected to sign a bill that will expand state hate crime statutes to include any attack on a police officer, EMT or firefighter. HB 953 has passed in both chambers of the state legislature, and if it’s signed, Louisiana would be first state in the country with such a law. State Rep. Lance Harris (R) said he was inspired to pen the bill following the murder of Sheriff’s Deputy Darren Goforth in Houston last August. “It looked like it was strictly done because someone didn’t like police officers, like a hate crime,” Harris told CNN on Friday. HB 953 is commonly known as “Blue Lives Matter,” a phrase co-opted from the Black Lives Matter movement and that stands as a counterpoint to criticisms of police brutality. The Blue Lives Matter movement maintains that in fact, police officers are under attack and need extra protections. “There is a concerted effort in some areas to terrorize and attack police and I think this will go forward and stop that,” Harris added, citing social media attacks on police officers. 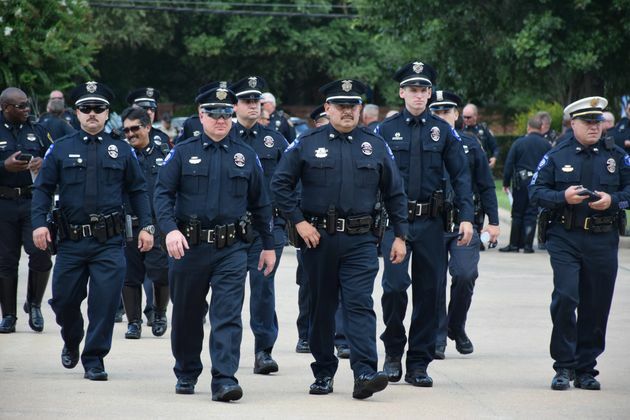 Policemen arrive at the funeral for Harris County Deputy Darren Goforth in Houston on Sept.4, 2015. But rates of assault and deadly violence against police in the U.S. have actually declined. Only 41 police officers were intentionally killed while on duty in 2015 — nearly a 20 percent decrease from 2014 — making it one of the safest years for police officers on record, according to preliminary statistics from the FBI. Critics of the bill say hate crime legislation should stick to race, religion, ethnicity and other static attributes. Others have asserted that it is actually citizens and not police who are under siege. Officers are heavily protected by the justice system: They typically do not face legal repercussions for using lethal force against civilians, and when someone kills an officer, they are usually swiftly prosecuted to the full extent of the law. In some states, such as Michigan and New York, killing a police officer is an automatic first-degree murder charge. The New Orleans chapter of Black Youth Project 100, a black activist organization, is asking that Edwards veto the bill. Edwards is expected to sign the bill this week, his press secretary Shauna Sanford told The Huffington Post. CORRECTION: An earlier version of this post incorrectly referred to the “Blue Lives Matter” legislation as HB 923. It is HB 953.